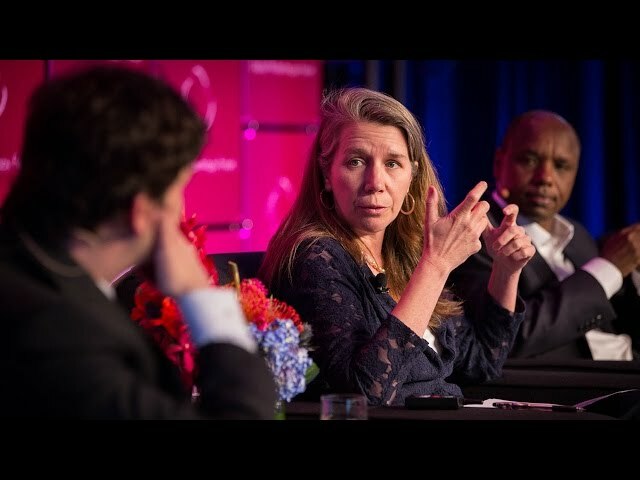 Jeanne Bourgault, the CEO of Internews, an international non-profit organization that works at the intersection of media, information, and development. Internews’s purpose is to ensure all people are fully empowered with the information they need to have a voice in their future and to make informed choices for their families and their communities. Bourgault joined Internews in 2001 and under her leadership, Internews has led the sector in focusing on the need for information amid crises, working to support local news and information access for communities affected by disaster, conflict, propaganda, climate change and closing spaces. Prior to Internews, Bourgault worked internationally in countries undergoing dramatic shifts in media and political landscapes. She worked in the former Yugoslavia, serving as a strategic advisor for media development programs in post-war Kosovo, as well as manager of community development projects in Serbia and Montenegro through the fall of Slobodan Milosevic. She served for six years with the US Agency for International Development, including three years at the US Embassy in Moscow. Bourgault speaks on issues of global news, information technology, media development and democracy assistance worldwide, including venues such as the Skoll World Forum, Guardian Activate in New York, the Clinton Global Initiative and the World Economic Forum in Davos. Bourgault has testified before the Foreign Operations Subcommittee of the US House Appropriations Committee on several occasions. She serves on the Media, Entertainment, and Information Industries Steering Committee for the World Economic Forum, the Steering Committee of the Global Forum for Media Development and World Learning’s Global Advisory Council. She holds a master of arts in International Studies and a master’s in public affairs from the University of Washington.